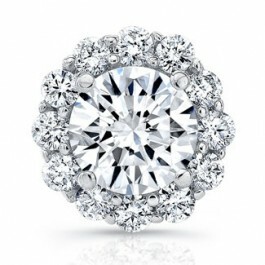 The Diamond, is honored as the April birthstone, and prized for it's bright sparkle and natural hardness. Through the centuries the diamond's mystical powers are thought to possess the ability to bond people together with love, intellect and emotional enlightening. Each earring sports a gemstone, encircled with a halo of shared prong set diamonds. The settings are handcrafted in the United Sates with only the highest quality precious metals and set with natural diamonds. Timeless and elegant these earrings would make a stylish accessory sure to catch the eye of many admirers. What gemstone are you looking for? What is your desired carat weight?